AXELOS, the global best practice solutions provider, approached Farrows looking for inspiration to launch their new IT qualification, ITIL Practitioner, in a campaign that spans print, digital and video. 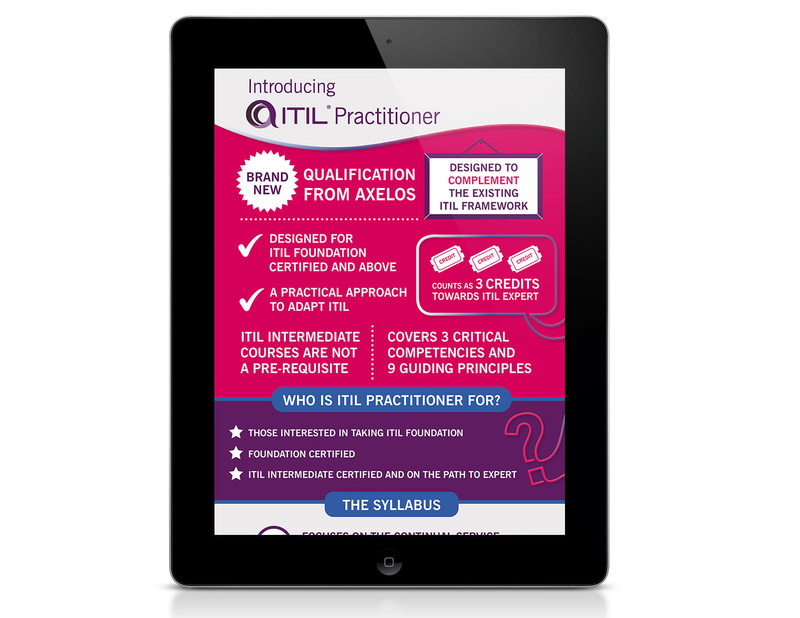 The ITIL qualification portfolio is well known and respected by industry professionals. AXELOS tasked us with the challenge of communicating ITIL Practitioner’s benefits and USPs to position it as ‘not just another ITIL qualification’ but the next step on from ITIL Foundation which bridges the gap enabling candidates to take their knowledge and learn how to apply it in their workplace for best effect. The campaign needed to communicate to both new and existing audiences. We worked closely with the team at AXELOS to understand their proposition and target audience. A key aim of the brief was to create a look that would achieve cut through and translate across multiple platforms. We developed an interruptive look to communicate the qualification’s difference. Short, impactful messaging delivered key facts in easy to digest segments, and use of icons broke up large bodies of text and helped make the collateral more visually engaging. The campaign spanned print and digital advertising, brochures, flyers, infographics, HTML emails and a motion graphic. Overall a real team effort and our cross-agency teams loved working on such a rewarding and successful campaign!